Also, if you select a utility feature, you see some information which can be edited in the Element Information property panel and a lot more information in the Utility Properties. 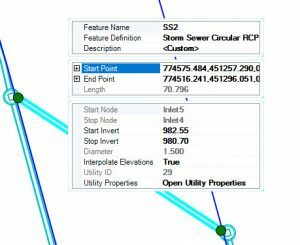 The Utility Properties lists every available hydraulic SUE property available, including user-customized properties. 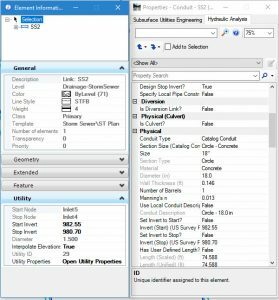 The Element Information panel lists the CADD properties such as level and color, the feature definition and a subset of the hydraulic and SUE properties. Bentley attempted to anticipate the most commonly edited hydraulic properties and placed them in the Element Information property panel. 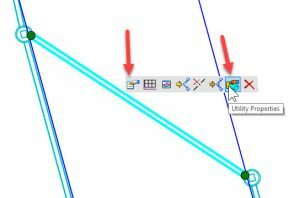 The reason for two property panels is that the Subsurface Utility tools represents the merger of two very different technologies. OpenRoads builds the 3D models of the utilities but Bentley’s Haestad technology performs the analytic modeling for hydraulics and Subsurface Utility Engineering. Current releases of SUDA reflect an incomplete merger of these technologies which Bentley has stated plans to finalize in later versions. If I can edit the value in the Quick Properties, then I do. It is quick and easy and presents many of the common edits. 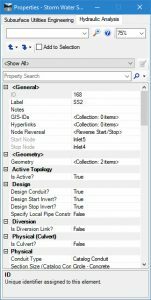 If the property is not shown in the Quick Properties, then I skip Element Information and go straight to the Utility Property panel. By reviewing and editing properties in this way, I avoid the major points of confusion which results from having two property panels.